There are few things in life that are both legal and awesome. A taste of home is one of them. Fortunately, the DC area has a few gems that feed the need of recent transplants to teleport back to wherever by way of a few really tasty bites. Here are 10 that get it right. 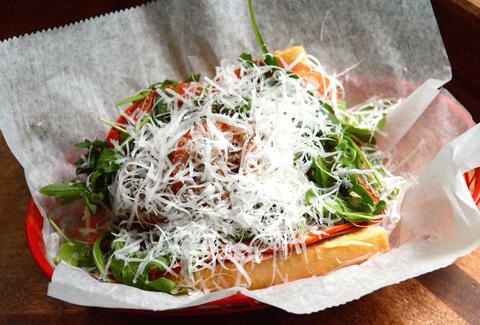 The only thing un-Philadelphian about the family behind Bub & Pop’s is their warmth. 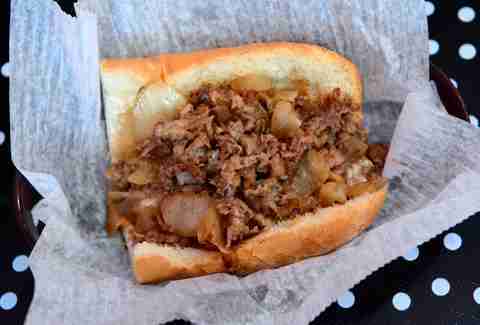 You’ll leave asking for adoption papers instead of the attitude readjustment Pat’s and Geno’s employees require. Chef Jonathan Taub’s cheesesteak gives Eagles fans something to smile about with tender rib eye, just-right onions, and Lyon Bakery loaves that do a fine impression of Amoroso's rolls. Underneath it all is a scary-good spread. "It’s mayo, ketchup, and pickles -- that’s how we do it back home, I just mixed them all together," Jonathan says. Tack on a Yuengling and a wuterice -- they sell those too. Close your eyes when you bite into these fish tacos and you’ll be brought back to better times when rush hour was at 3pm, four-person bikes were a thing, and a shell of a North Face was considered a "winter jacket." Chef Eddie Moran’s ability to drop perfect-ten tacos every time is no coincidence. He has his Mexican heritage and SoCal upbringing to thank, and so do San Diegans stuck in DC. 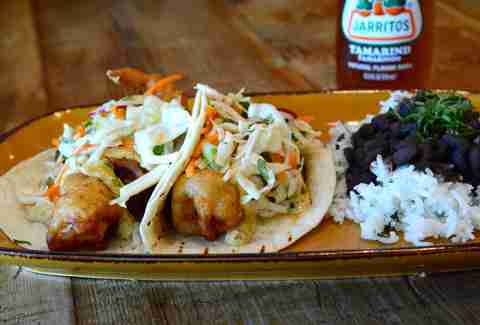 The restaurant’s namesake dish comes with local fried fish, slaw that isn’t slimy, and Eddie’s signature sauce -- a mayo mixture boosted by charred corn and guajillo chiles. They’re good enough to get Philip Rivers’ mouth to curl into an actual grin. Fond memories of that 3-Way you had at Skyline? Yeah, we thought so. 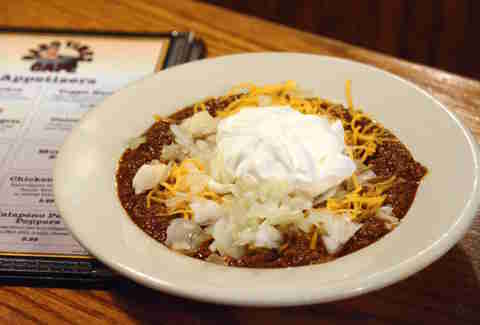 First explain to your friend who doesn’t hail from Queen City that a 3-Way, 4-Way, or 5-Way is nothing sexual, and then bring him with you to Hard Times to stick a spoon into a cinnamon-spiked, sweet meat pile that conjures up memories of watching the Reds with dad. Get it in a boring bowl or atop spaghetti for FTW. The DC region is blanketed with 16 locations to get your chili mac fix -- including inside Nationals Park and the Verizon Center. Pit masters in other parts of the country have the audacity to discard the best part of brisket, but Kansas City knows better. One only has to look to Wagyu beef or otoro to know the fattiest cuts of meat are to be savored. 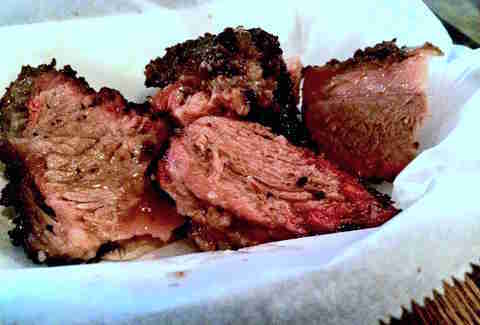 Royals fans can get their burnt ends fix at Fat Pete’s Barbecue, where they get the fat-to-charred-bark content just right, thanks to four extra hours in the smoker. We can’t promise they’ll always be available, so call first. We also can’t promise that they’ll play Tech N9ne. 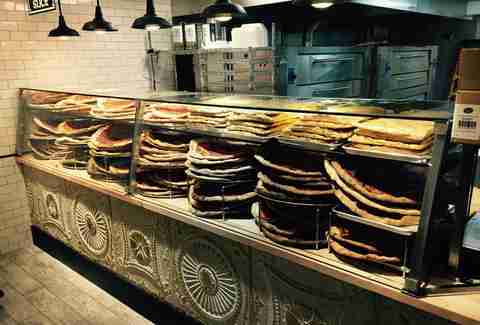 Wiseguy NY Pizza may have a 202 area code instead of a 212, but they nail New York-style pizza. You can fold it, walk with it, and hail a cab with it -- all while avoiding eye contact. Owner Tony Erol says the key to authenticity is being stubborn. "You can’t change with the trends," he says. That’s why you won’t find promises of a 90-second pie on a conveyor belt. Instead, his 20-inchers bake in an actual brick oven. New Yorkers who now call DC home (grudgingly, we know) should appreciate that the shop is open until 5am on Fridays and Saturdays because of that whole city-that-never-sleeps mantra. 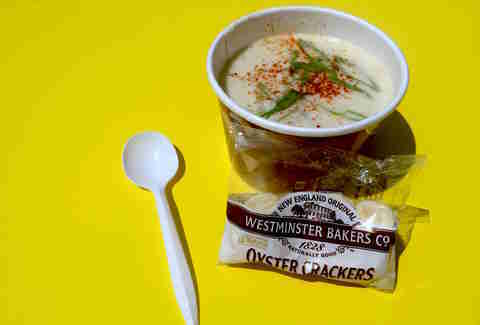 You have to hit a food truck to get wicked-good New England clam chowder in these parts. Enter Red Hook Lobster Pound, whose team goes to great lengths for authenticity. They bring the base of the soup in from Portland, Maine and only use the best ingredients. Obviously, each creamy bowl comes with Westminster Oyster Crackers. If you’re following the Vince Wilfork diet, get a "Chowdah Meal," which comes with a full lobstah roll, chowdah, oyster crackers, and a drink for $22. Find the truck here -- it’s much easier than using a GPS in Boston. When Detroit’s own Jack White sang, "And the feeling coming from my bones says find a home," he was talking about snagging a stool at Ivy and Coney. We swear. The Lafayette-style coney dog is THAT legit with its thin chili sauce, diced raw onions, and mustard. Try the $4 snack alongside Vernors, aka "Michigan Pop," or something a little stronger like Stroh’s. Windy city transplants will also feel at home thanks to Chicago-style dogs and Jeppson’s Malort. 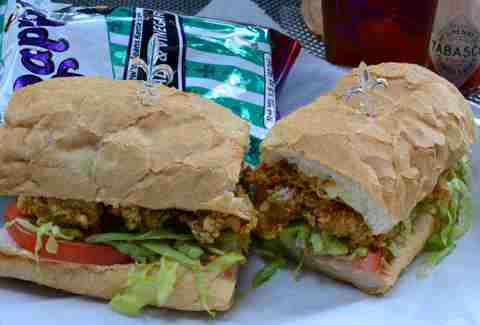 Acadiana’s "Peacemaker" po-boy stands out because the Louisiana restaurant recognizes the importance of good bread. That’s why they bring it in from Leidenheimer in New Orleans. Inside the crusty French roll, N0LA natives will find juicy fried oysters dressed with all the fixings (kind of like these). Take your sando out to the restaurant’s patio to soak in DC humidity that’s a Big Easy summer in disguise. Before opening Acadiana, Chef/Owner Jeff Tunks ate his way around New Orleans and the Bayou doing research, including a stop at oyster authority Casamento’s. 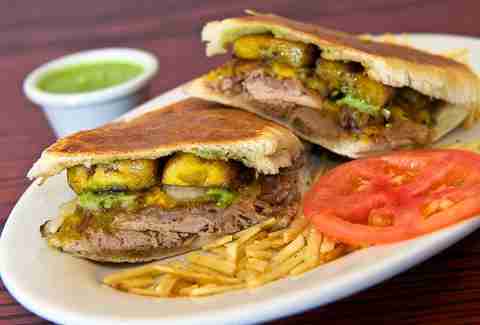 Granted, 19th S NW is not Calle Ocho, but Sophie’s Cuban Cuisine puts out a better Cubano than Jon Favreau’s character in Chef. There’s the original, stuffed with requisite roast pork, ham, Swiss, pickles, mayo, and mustard or there’s one there’s one "with a twist" that invites onions, sweet plantains, and Sophie’s addictive green sauce to the party (pictured). Cool off with a batido in flavors like passion fruit and tamarindo while trying not to audibly cry out for Versailles. 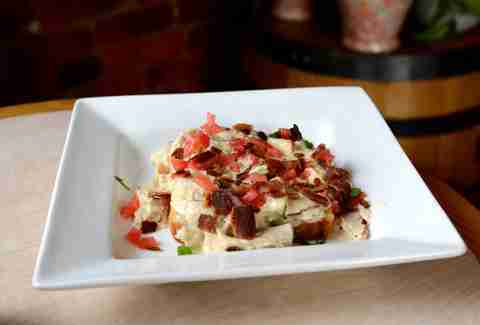 Louisville folks living locally in DC can get a bona fide Kentucky Hot Brown on the Bourbon brunch menu. The glorified turkey melt that makes you miss home comes with bacon, tomato, and, of course, gravy. The thick bread acts like a sponge soaking up the gravy and any bad feelings you may be experiencing from the previous night’s shenanigans. Speaking of which, pair your KHB with Bourbon’s barrel-aged mint julep.